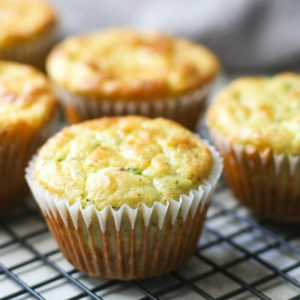 These gluten-free cheddar zucchini muffins are a savory and satisfying way to use up zucchini! Made with almond flour, cheddar, and garlic these low carb savory zucchini muffins are an easy meal prep breakfast or snack. Pulse the flour, eggs, baking soda and spices in a blender until smooth. Add 1 cup cheese and the zucchini. Pulse until the zucchini is evenly incorporated but not pureed. Here you should still see noticeable flecks of green throughout the batter. Spoon the batter into a lined muffin tin about 3/4 full. Top with the extra 1 Tbsp cheese. Bake at 350°F about 25 minutes until the muffins are golden and an inserted toothpick comes out clean. After about 3-5 minutes, or when the muffins are cool enough to touch, remove the muffins from the pan to cool on a cooling rack. Serve warm. Refrigerate any leftovers. Reheat in a toaster oven or the regular oven.